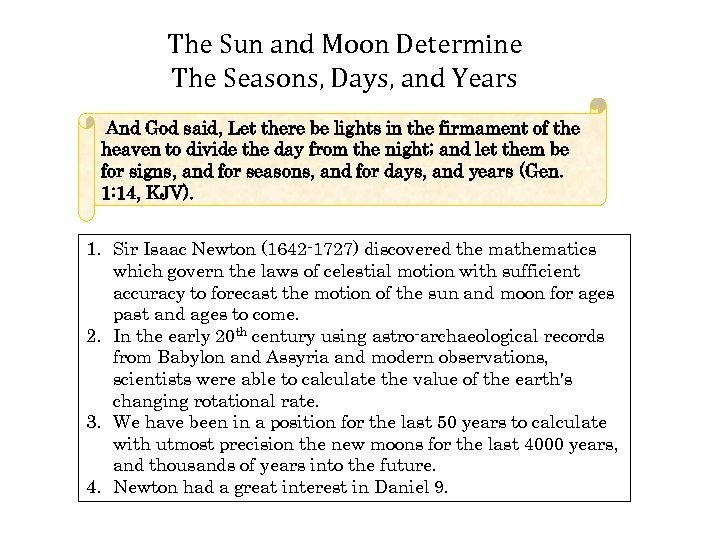 The Sun and Moon Determine The Seasons, Days, and Years And God said, Let there be lights in the firmament of the heaven to divide the day from the night; and let them be for signs, and for seasons, and for days, and years (Gen. 1: 14, KJV). 1. Sir Isaac Newton (1642 -1727) discovered the mathematics which govern the laws of celestial motion with sufficient accuracy to forecast the motion of the sun and moon for ages past and ages to come. 2. In the early 20 th century using astro-archaeological records from Babylon and Assyria and modern observations, scientists were able to calculate the value of the earth's changing rotational rate. 3. 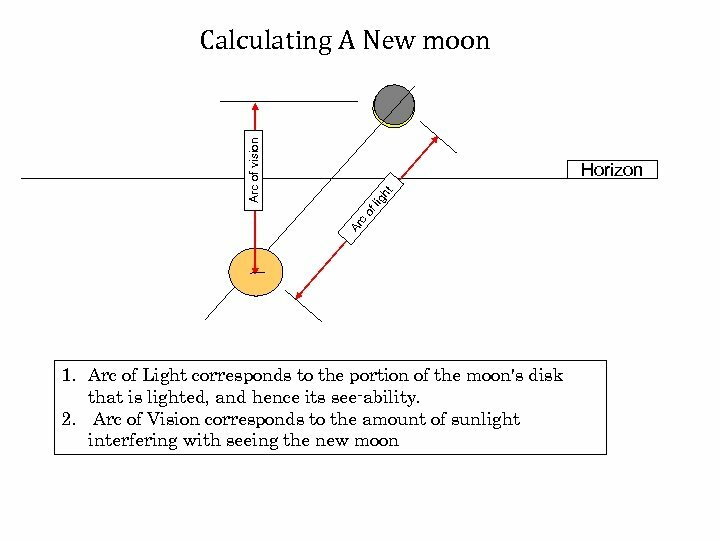 We have been in a position for the last 50 years to calculate with utmost precision the new moons for the last 4000 years, and thousands of years into the future. 4. Newton had a great interest in Daniel 9. Ar c of lig ht Arc of vision Observational Data from Eyewitnesses 1. 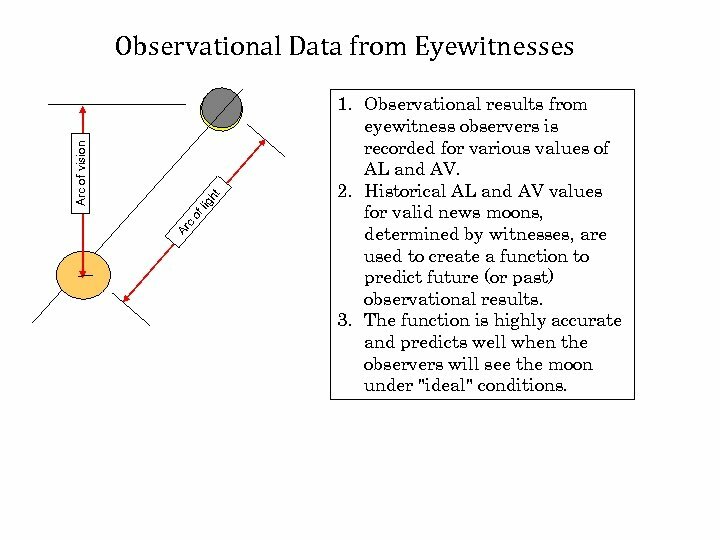 Observational results from eyewitness observers is recorded for various values of AL and AV. 2. Historical AL and AV values for valid news moons, determined by witnesses, are used to create a function to predict future (or past) observational results. 3. The function is highly accurate and predicts well when the observers will see the moon under "ideal" conditions. Ar c of lig ht Arc of vision What to do when conditions are not Ideal: 1. 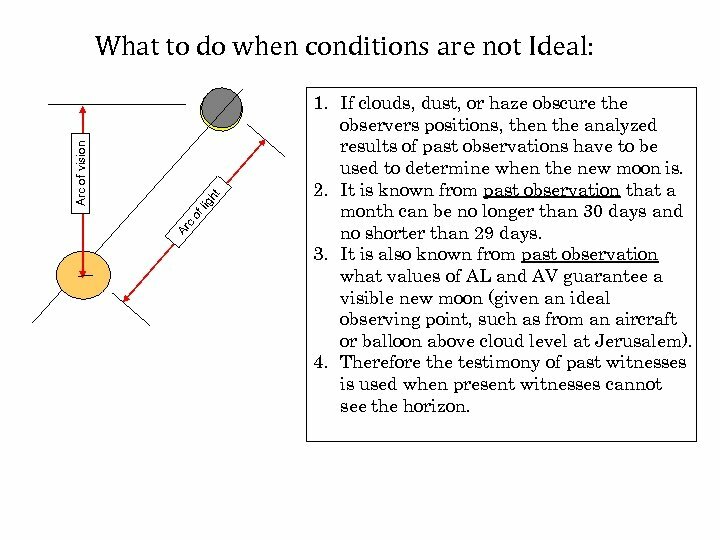 If clouds, dust, or haze obscure the observers positions, then the analyzed results of past observations have to be used to determine when the new moon is. 2. It is known from past observation that a month can be no longer than 30 days and no shorter than 29 days. 3. It is also known from past observation what values of AL and AV guarantee a visible new moon (given an ideal observing point, such as from an aircraft or balloon above cloud level at Jerusalem). 4. 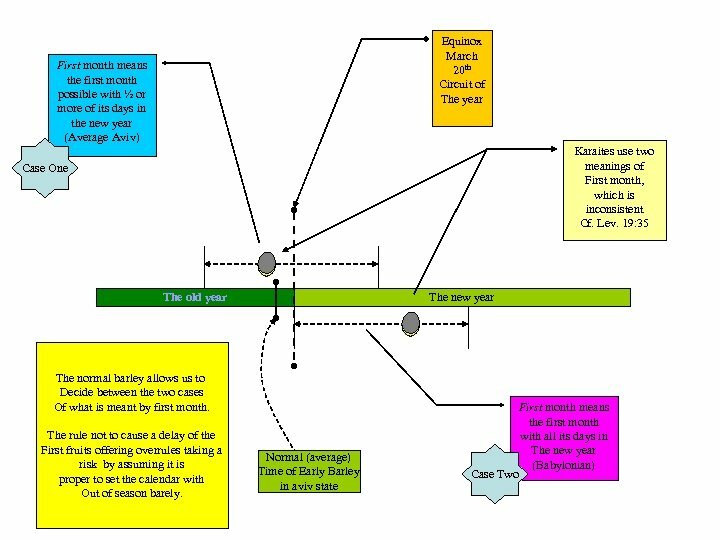 Therefore the testimony of past witnesses is used when present witnesses cannot see the horizon. Is the Karaite Rejection of Calculation Valid? 1. The Karaites use the fact that a month can have no more than 30 days to limit the length of a month when they cannot see the horizon. 2. This fact, that a month cannot have more than 30 days, is based on historical observation. 3. An astronomical calculation is a deduction based on past historical observations. 4. 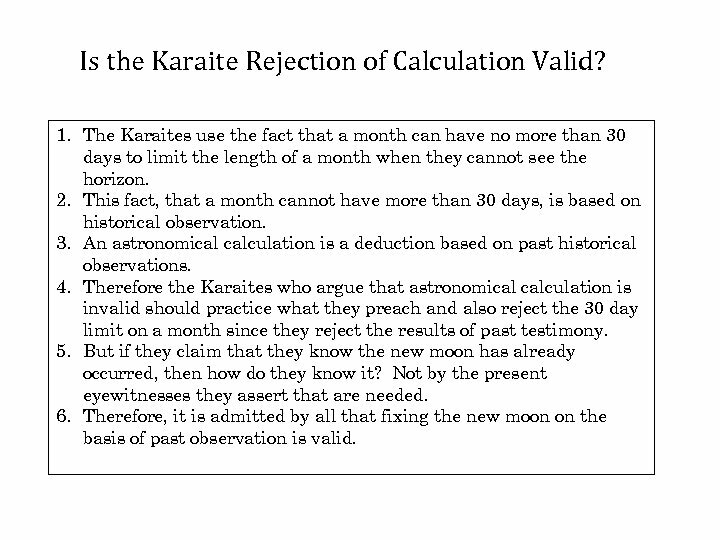 Therefore the Karaites who argue that astronomical calculation is invalid should practice what they preach and also reject the 30 day limit on a month since they reject the results of past testimony. 5. But if they claim that they know the new moon has already occurred, then how do they know it? Not by the present eyewitnesses they assert that are needed. 6. Therefore, it is admitted by all that fixing the new moon on the basis of past observation is valid. The Testimony of Many Witnesses Outweighs that of a few 1. 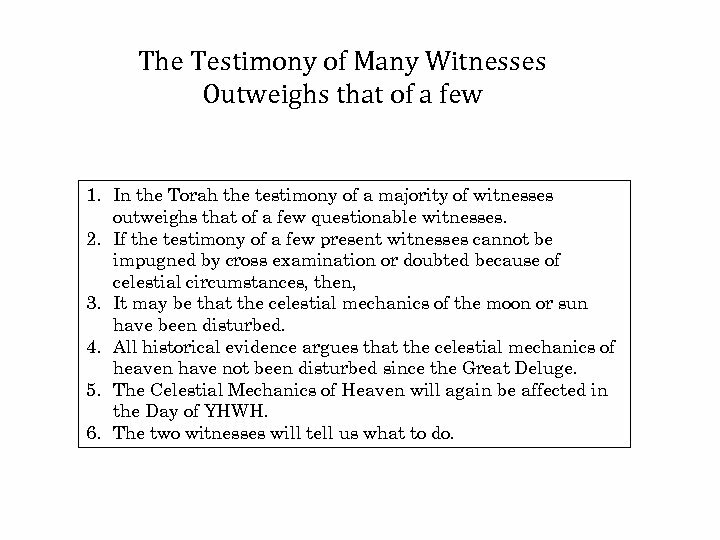 In the Torah the testimony of a majority of witnesses outweighs that of a few questionable witnesses. 2. If the testimony of a few present witnesses cannot be impugned by cross examination or doubted because of celestial circumstances, then, 3. It may be that the celestial mechanics of the moon or sun have been disturbed. 4. All historical evidence argues that the celestial mechanics of heaven have not been disturbed since the Great Deluge. 5. The Celestial Mechanics of Heaven will again be affected in the Day of YHWH. 6. The two witnesses will tell us what to do. The Location of Observation 1. The proper place of observation is the mountain of YHWH. 2. This is the place that he chooses to put his name. 3. This place is Jerusalem. 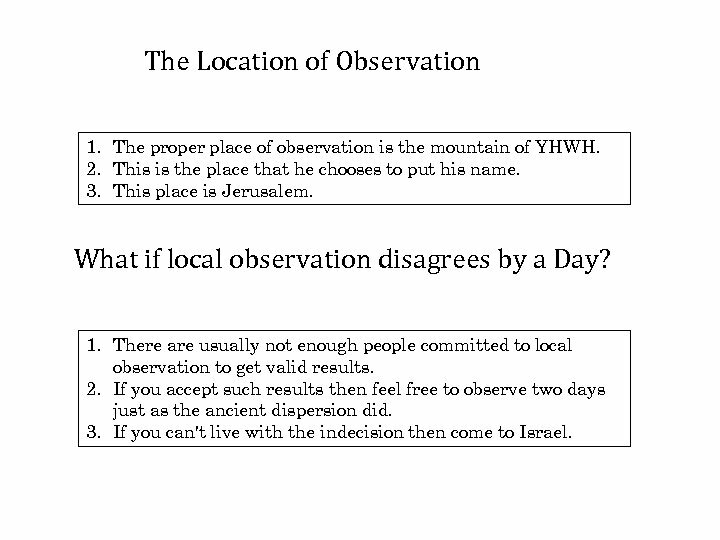 What if local observation disagrees by a Day? 1. There are usually not enough people committed to local observation to get valid results. 2. If you accept such results then feel free to observe two days just as the ancient dispersion did. 3. If you can't live with the indecision then come to Israel. How to Intercalate the Year 1. 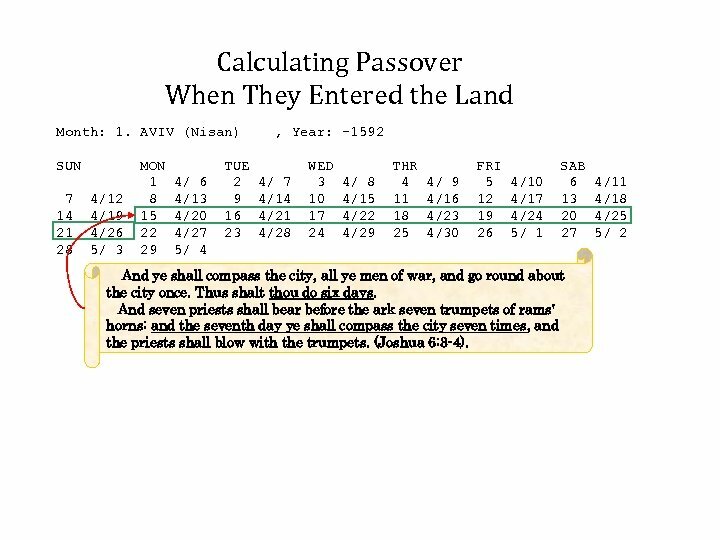 Three times a year Israel is to go up to the feasts (Exodus 23: 14) 2. Therefore three feasts must fall in one year. 3. The definitions of the year: 1. The natural year determined by the sun from equinox to equinox. 2. The sacred year determined by the moon from the new moon of the seventh month to the last day of Ellul. 4. 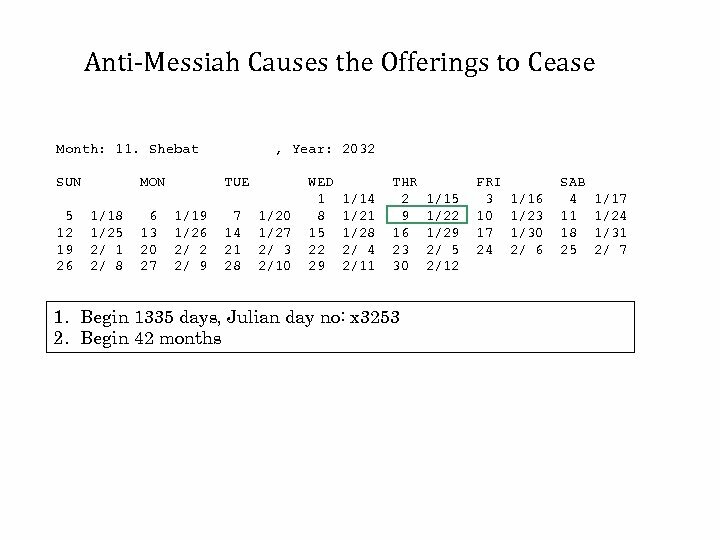 The natural year must be meant (Deut. 16: 16). 5. The ripening of the barley is a factor. 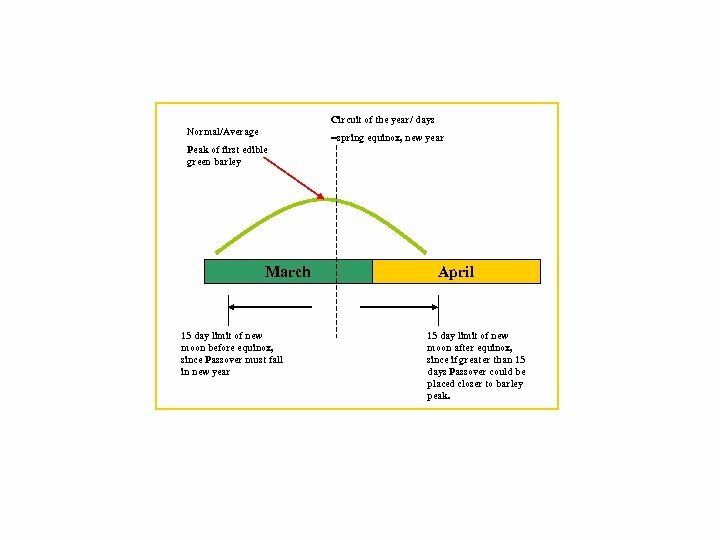 Circuit of the year/ days Normal/Average =spring equinox, new year Peak of first edible green barley March 15 day limit of new moon before equinox, since Passover must fall in new year April 15 day limit of new moon after equinox, since if greater than 15 days Passover could be placed closer to barley peak. The Bottom Line on Karaite Intercalation 1. 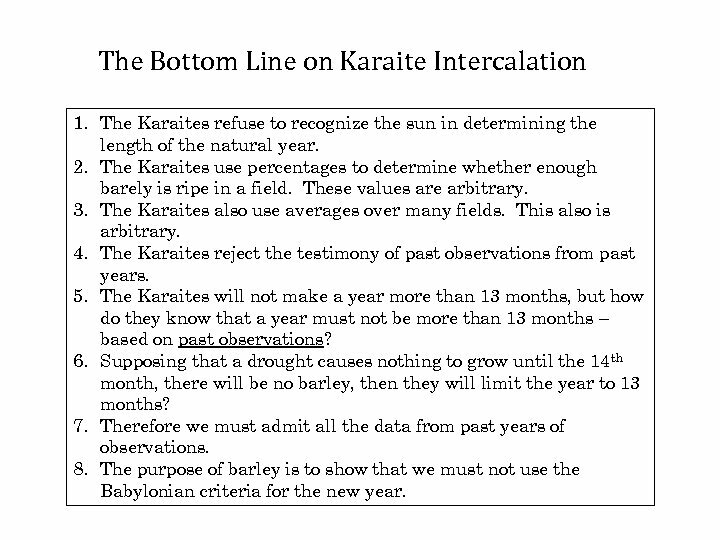 The Karaites refuse to recognize the sun in determining the length of the natural year. 2. The Karaites use percentages to determine whether enough barely is ripe in a field. These values are arbitrary. 3. The Karaites also use averages over many fields. This also is arbitrary. 4. The Karaites reject the testimony of past observations from past years. 5. 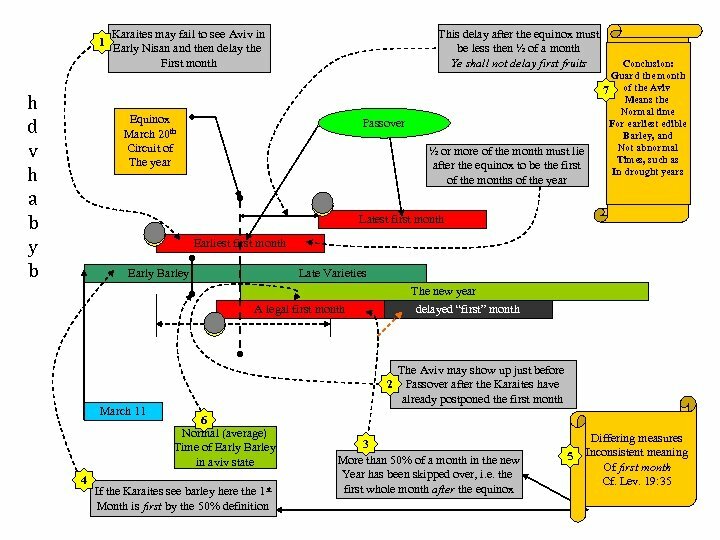 The Karaites will not make a year more than 13 months, but how do they know that a year must not be more than 13 months – based on past observations? 6. Supposing that a drought causes nothing to grow until the 14 th month, there will be no barley, then they will limit the year to 13 months? 7. Therefore we must admit all the data from past years of observations. 8. 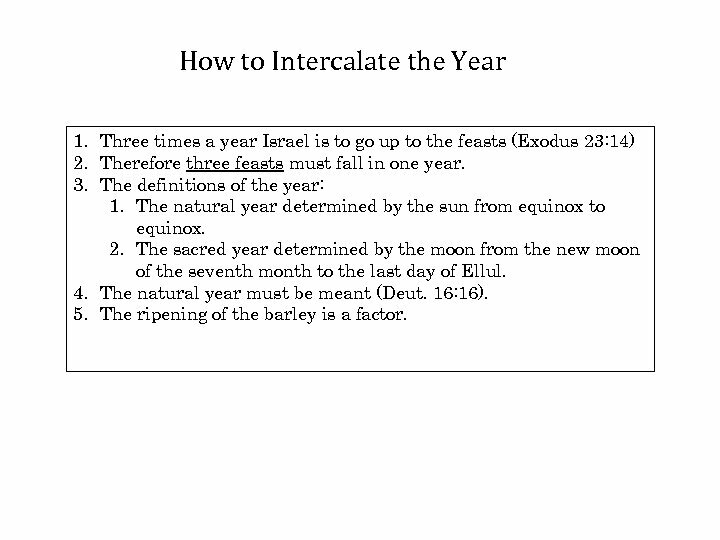 The purpose of barley is to show that we must not use the Babylonian criteria for the new year. 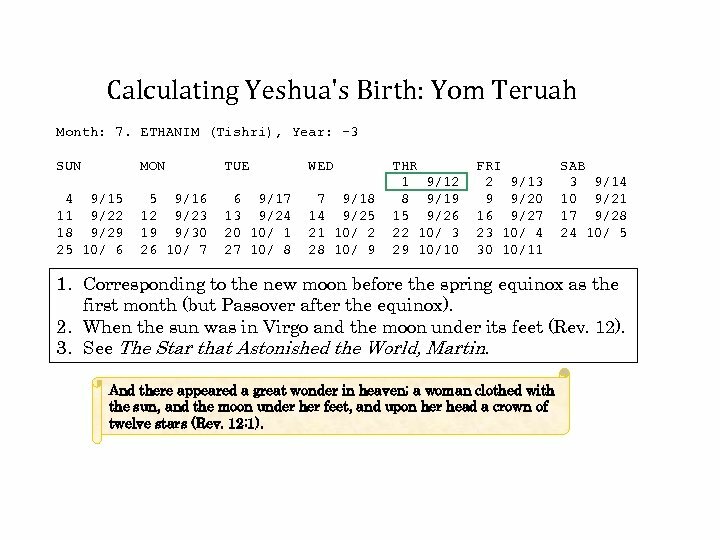 Calculating Yeshua's Birth: Yom Teruah Month: 7. 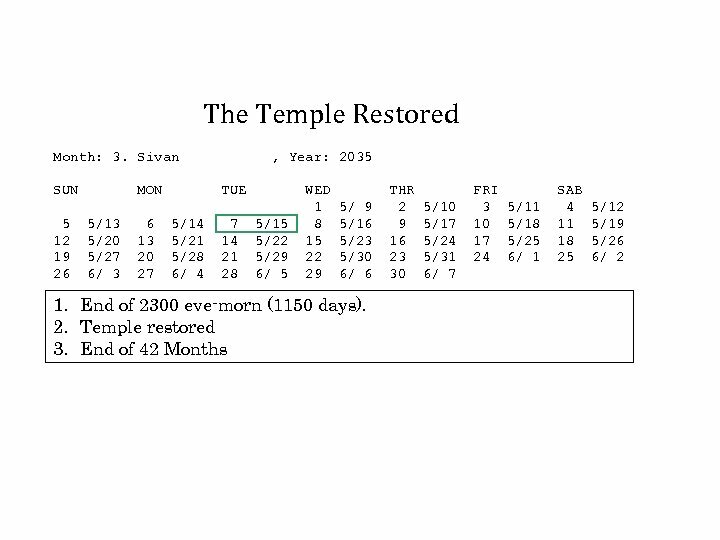 ETHANIM (Tishri), Year: -3 SUN MON TUE WED 4 9/15 11 9/22 18 9/29 25 10/ 6 5 9/16 12 9/23 19 9/30 26 10/ 7 6 9/17 13 9/24 20 10/ 1 27 10/ 8 7 9/18 14 9/25 21 10/ 2 28 10/ 9 THR 1 9/12 8 9/19 15 9/26 22 10/ 3 29 10/10 FRI 2 9/13 9 9/20 16 9/27 23 10/ 4 30 10/11 SAB 3 9/14 10 9/21 17 9/28 24 10/ 5 1. 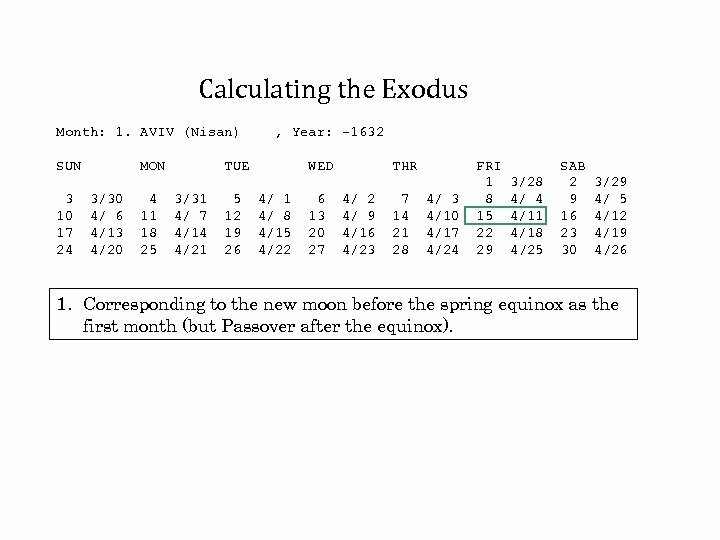 Corresponding to the new moon before the spring equinox as the first month (but Passover after the equinox). 2. When the sun was in Virgo and the moon under its feet (Rev. 12). 3. See The Star that Astonished the World, Martin. And there appeared a great wonder in heaven; a woman clothed with the sun, and the moon under her feet, and upon her head a crown of twelve stars (Rev. 12: 1). 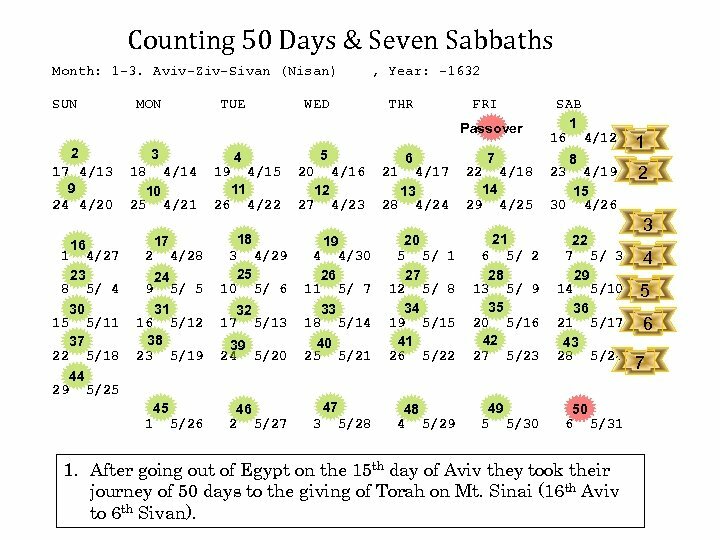 Calculating the Exodus Month: 1. AVIV (Nisan) SUN 3 10 17 24 MON 3/30 4/ 6 4/13 4/20 4 11 18 25 , Year: -1632 TUE 3/31 4/ 7 4/14 4/21 5 12 19 26 WED 4/ 1 4/ 8 4/15 4/22 6 13 20 27 THR 4/ 2 4/ 9 4/16 4/23 7 14 21 28 4/ 3 4/10 4/17 4/24 FRI 1 8 15 22 29 3/28 4/ 4 4/11 4/18 4/25 SAB 2 9 16 23 30 3/29 4/ 5 4/12 4/19 4/26 1. 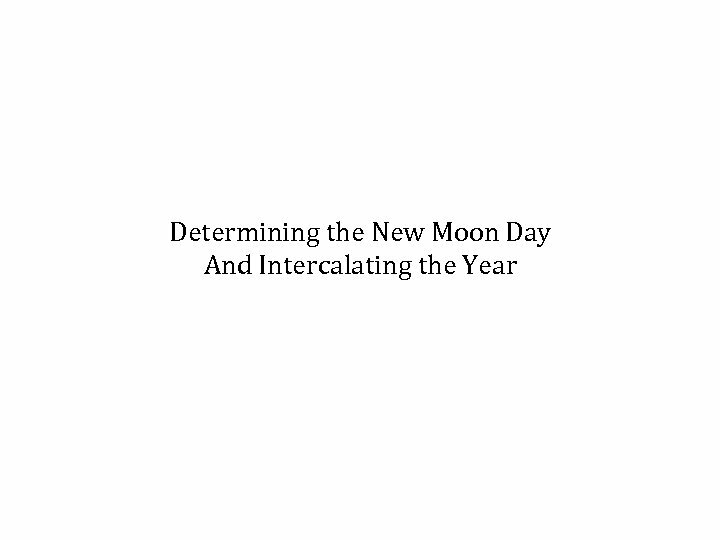 Corresponding to the new moon before the spring equinox as the first month (but Passover after the equinox). 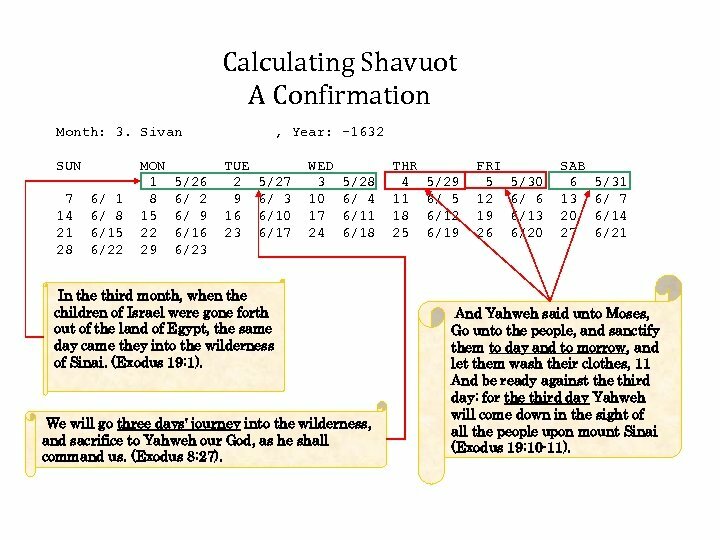 Calculating Shavuot A Confirmation Month: 3. Sivan SUN 7 14 21 28 6/ 1 6/ 8 6/15 6/22 MON 1 8 15 22 29 5/26 6/ 2 6/ 9 6/16 6/23 , Year: -1632 TUE 2 9 16 23 5/27 6/ 3 6/10 6/17 WED 3 10 17 24 5/28 6/ 4 6/11 6/18 In the third month, when the children of Israel were gone forth out of the land of Egypt, the same day came they into the wilderness of Sinai. (Exodus 19: 1). We will go three days' journey into the wilderness, and sacrifice to Yahweh our God, as he shall command us. (Exodus 8: 27). THR 4 11 18 25 5/29 6/ 5 6/12 6/19 FRI 5 12 19 26 5/30 6/ 6 6/13 6/20 SAB 6 13 20 27 5/31 6/ 7 6/14 6/21 And Yahweh said unto Moses, Go unto the people, and sanctify them to day and to morrow, and let them wash their clothes, 11 And be ready against the third day: for the third day Yahweh will come down in the sight of all the people upon mount Sinai (Exodus 19: 10 -11). 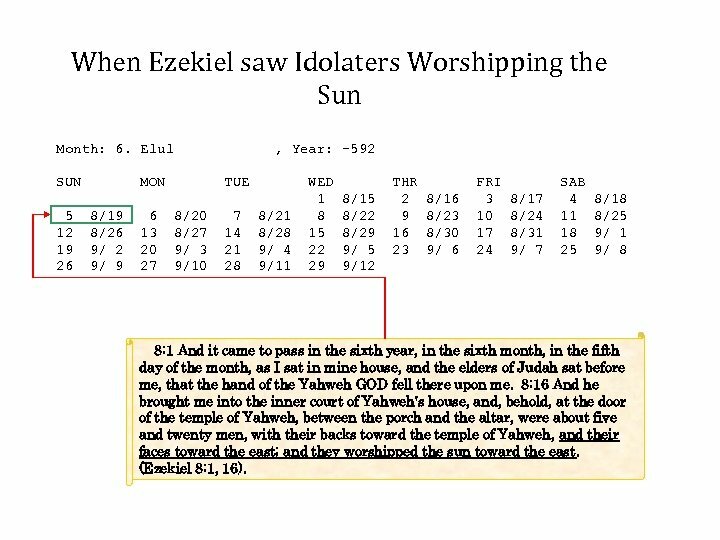 When Ezekiel saw Idolaters Worshipping the Sun Month: 6. 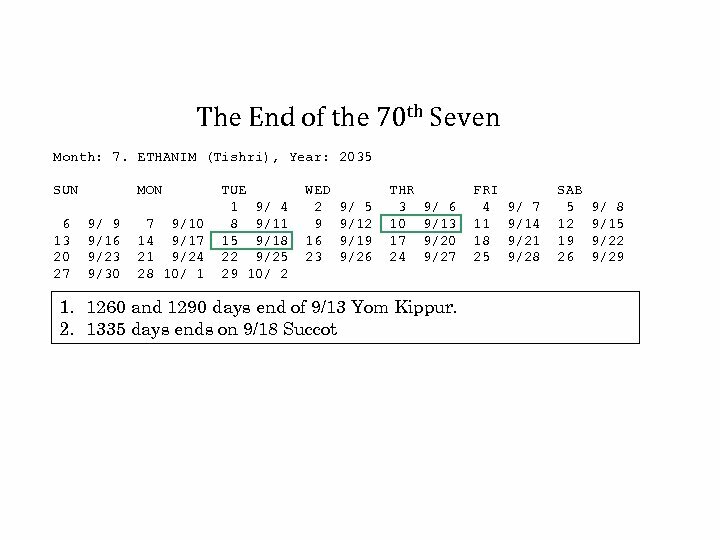 Elul SUN 5 12 19 26 , Year: -592 MON 8/19 8/26 9/ 2 9/ 9 6 13 20 27 TUE 8/20 8/27 9/ 3 9/10 7 14 21 28 8/21 8/28 9/ 4 9/11 WED 1 8 15 22 29 8/15 8/22 8/29 9/ 5 9/12 THR 2 9 16 23 8/16 8/23 8/30 9/ 6 FRI 3 10 17 24 8/17 8/24 8/31 9/ 7 SAB 4 11 18 25 8/18 8/25 9/ 1 9/ 8 8: 1 And it came to pass in the sixth year, in the sixth month, in the fifth day of the month, as I sat in mine house, and the elders of Judah sat before me, that the hand of the Yahweh GOD fell there upon me. 8: 16 And he brought me into the inner court of Yahweh's house, and, behold, at the door of the temple of Yahweh, between the porch and the altar, were about five and twenty men, with their backs toward the temple of Yahweh, and their faces toward the east; and they worshipped the sun toward the east. 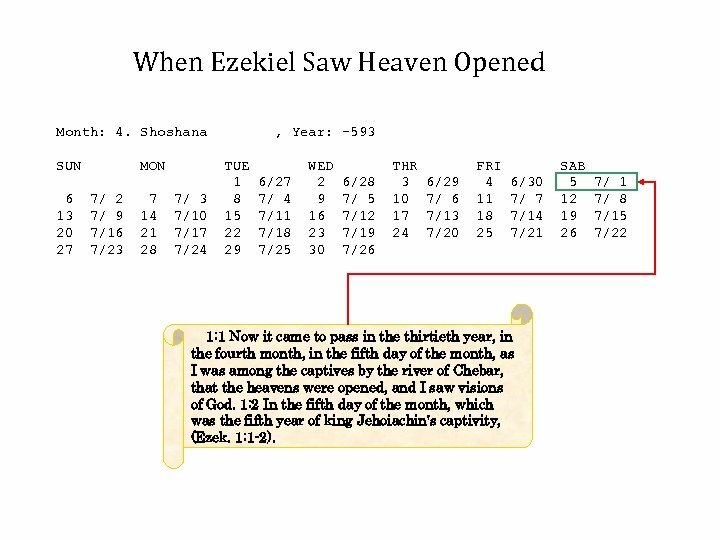 (Ezekiel 8: 1, 16). Sources 1. 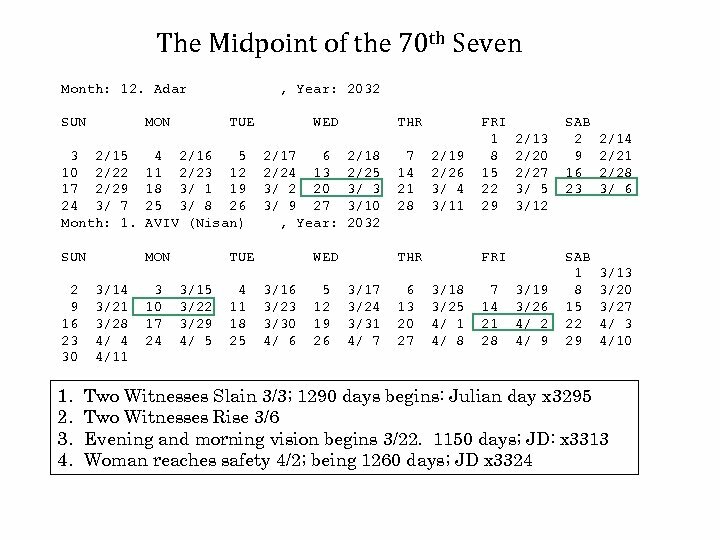 Neo-Babylonian Dates: Babylonian Chronology (626 B. C. to A. D. 75), Parker and Dubberstein. 1. Confirms Passion Calculations 2. Goldstein, New Moons. 3. EZCosmos Software. 4. JPL Source code, Steve Moshier. 1. From which I constructed the new moon program 2. I used the code to calculate positional data without modifying any of the internal software. 5. 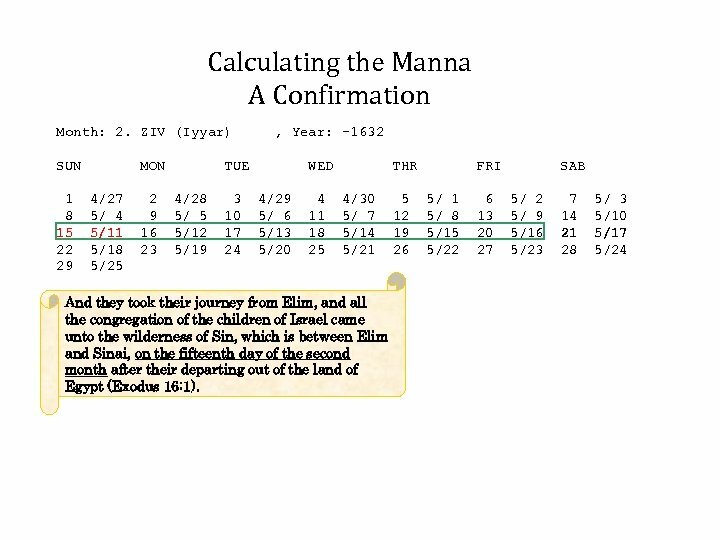 Finegan, Handbook of Biblical Chronology, rev. edition. 1. Confirms Passion Calculations. 6. Expert Astronomer Software. 7. Internet databases. 8. Earth Centered Universe. 9. Sky. Map 10. 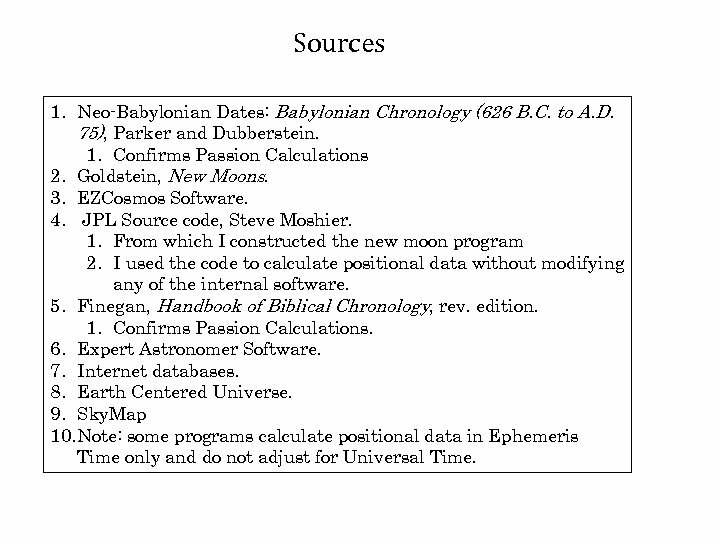 Note: some programs calculate positional data in Ephemeris Time only and do not adjust for Universal Time. Research Milestones 1. 1980 Read Ralph Woodrow's, Babylon Mystery Religion. 2. 1982 -1984 1. 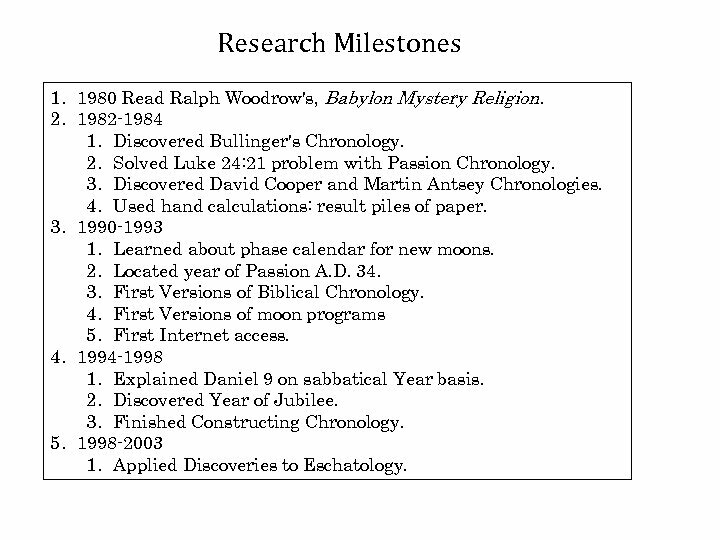 Discovered Bullinger's Chronology. 2. 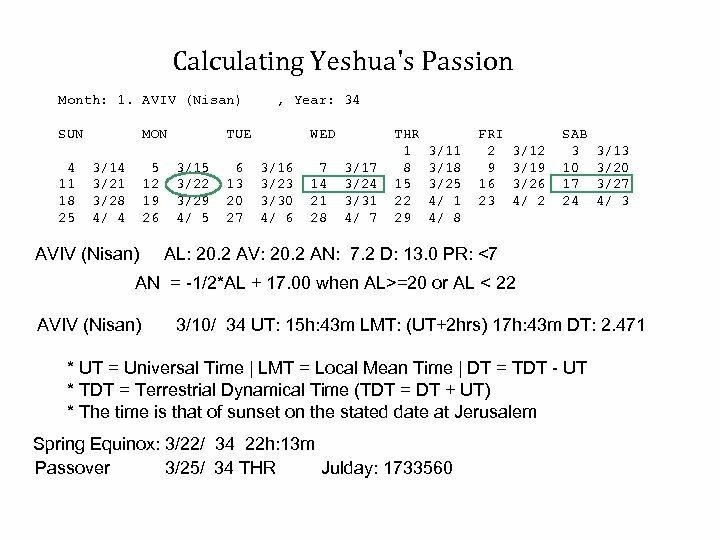 Solved Luke 24: 21 problem with Passion Chronology. 3. Discovered David Cooper and Martin Antsey Chronologies. 4. Used hand calculations: result piles of paper. 3. 1990 -1993 1. Learned about phase calendar for new moons. 2. Located year of Passion A. D. 34. 3. 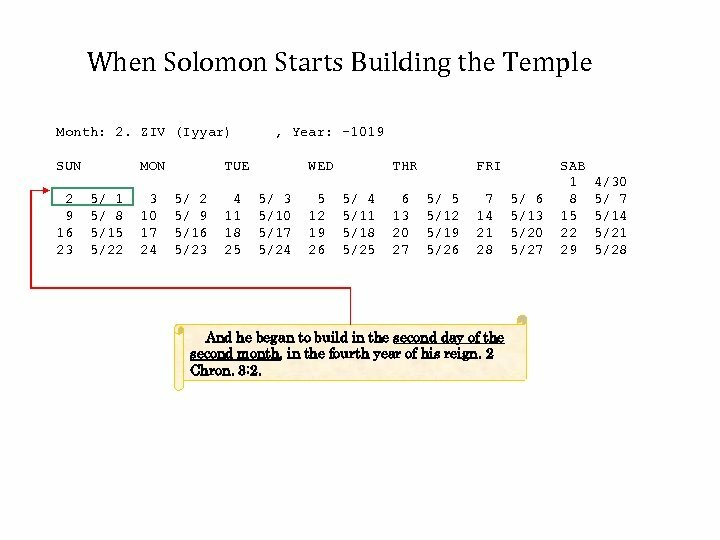 First Versions of Biblical Chronology. 4. First Versions of moon programs 5. First Internet access. 4. 1994 -1998 1. 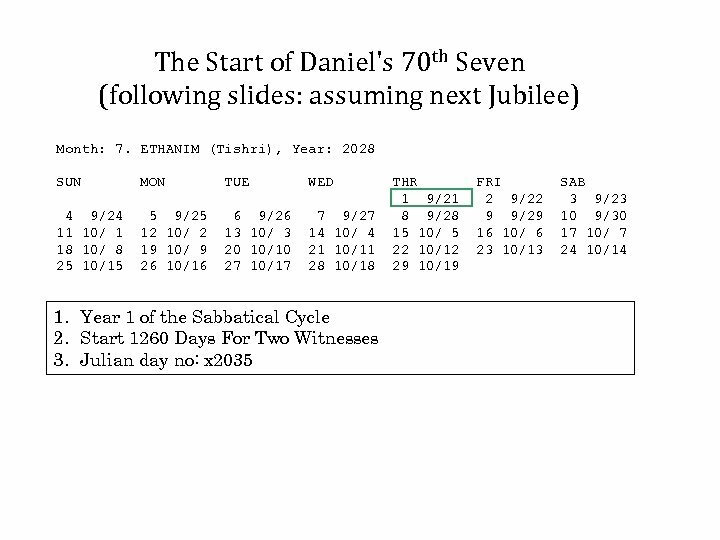 Explained Daniel 9 on sabbatical Year basis. 2. Discovered Year of Jubilee. 3. Finished Constructing Chronology. 5. 1998 -2003 1. Applied Discoveries to Eschatology.